high-end options a viable alternative. Trig Modern in Raleigh, the design center and showroom in Dock 1053 on East Whitaker Mill Road, has announced that it is now offering two new high-end modern, custom area rug collections from California: Emma Gardner Design, LLC, of Petaluma and Savnik & Co. of San Francisco. Established in 2002 by Emma Gardner of Kyoto, Japan, Emma Gardner Design’s primary products are couture area rugs that are hand-made and GoodWeave-certified* in Nepal. Based on original copyrighted designs, the rugs are hand-knotted using hand-carded, hand-spun, pot-dyed Tibetan wool, and fine Chinese silk. Each one is made to order. Categories include Floral/Asian, Geometric, Organic Natural, and Signature, among others. Savnik & Company is a family-owned business founded over 50 years ago. 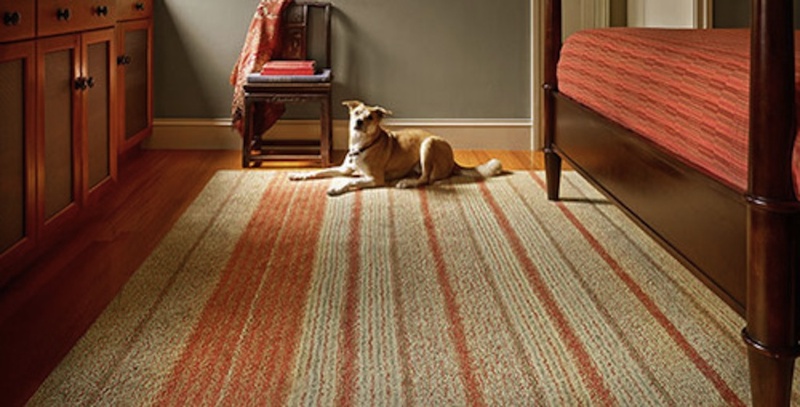 Its rugs and carpets are made of 100 percent wool that is skein-dyed for pure, even color. Its extensive line of textures can be augmented by custom treatments including shapes, sizes, over-tufted patterns, borders, and fringe. In addition to its 80 standard color palette, Savnik can also custom-match yarns to paint samples, fabric swatches, etc. For more information on Trig Modern, visit www.trigmodern.com or call 919. 516.8755. The handmade carpet industry exploits nearly 250,000 children. GoodWeave is helping to combat this problem and transform the rug industry by certifying child-labor-free rugs and by providing education and other opportunities to rescued- and at-risk children. GoodWeave certification assures that no children were involved in the making of a rug. Founded in December 2012, Trig Modern is owned and operated by furniture and lighting designer Bob Drake. Through its combination of modern and mid-century-inspired furniture, lighting, wall and floor coverings, and accessories, as well as Modern kitchen and bath remodeling services, Trig Modern’s mission is to present a realistic portrait of sensible living and offer an antidote to excess, formality, and convention. For more information visit www.trigmodern.com, call 919.516.8744, and find Trig Modern on Facebook. The showroom is located at 1053 East Whitaker Mill Road, Suite 109, Raleigh, NC 27604. “Craft and Furniture Makers for the 21st Century” is part of summer-long exhibition at the Contemporary Art Museum in downtown Raleigh. Free and open to the public, the event is part of CAM’s summer exhibition “20 Years of Horse & Buggy Press,” an award-winning printing shop and book production studio in Durham. The exhibition will run through August 7. Baum’s conversation will include Al Frega, Scott Howell, Ben Galata, Jessica Ullom from Hawks & Doves, and Anthony Ulinski of Dovetail Woodworks — five of the furniture makers who created custom works for a “living room-esque” space in CAM where the conversation will take place. Each of the five will talk about their work. Dave Wofford of Horse & Buggy Press will briefly discuss books as original artifacts. And Baum will lead a question-and-answer session following the individual presentations. Originally from Hopewell, Virginia, Ann Marie Baum co-founded Cherry Modern Design in Raleigh in 2004. 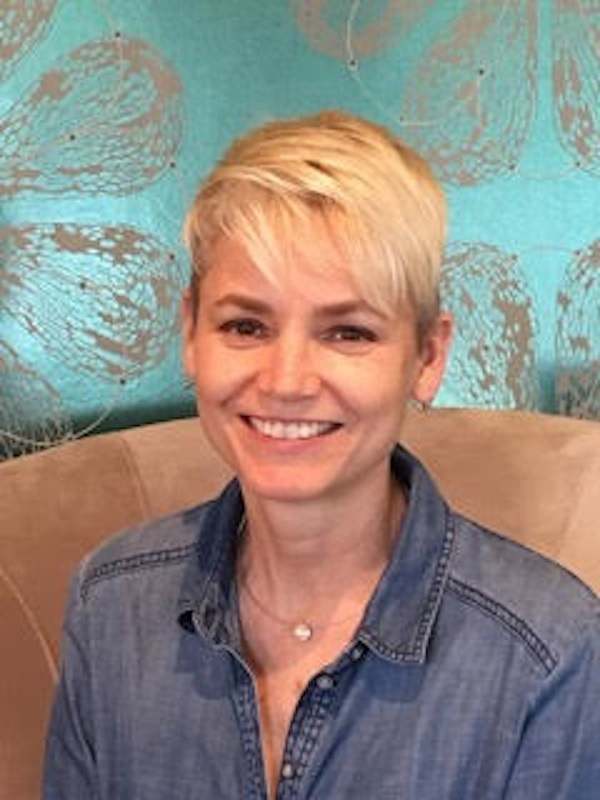 During her years at Cherry Modern Design, she collaborated with Clearscapes Architecture on the interiors of The Hudson condo building in downtown Raleigh and worked closely with architect Thomas Pheiffer and the NC Museum of Art staff to furnish the museum’s new wing and Iris Cafe. 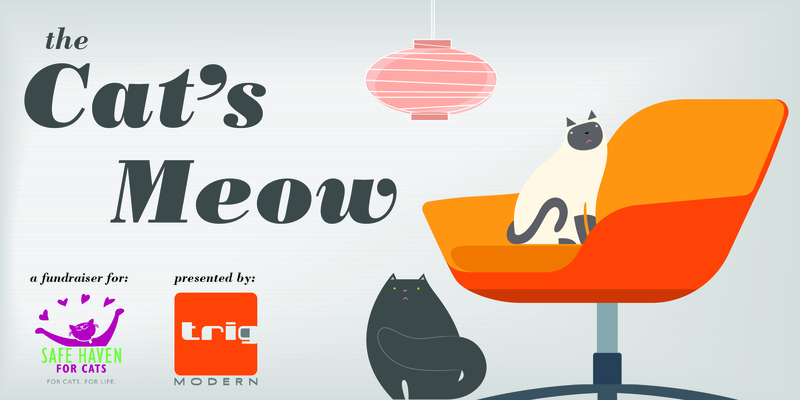 She joined Trig Modern in 2014, where she serves as lead interior designer. 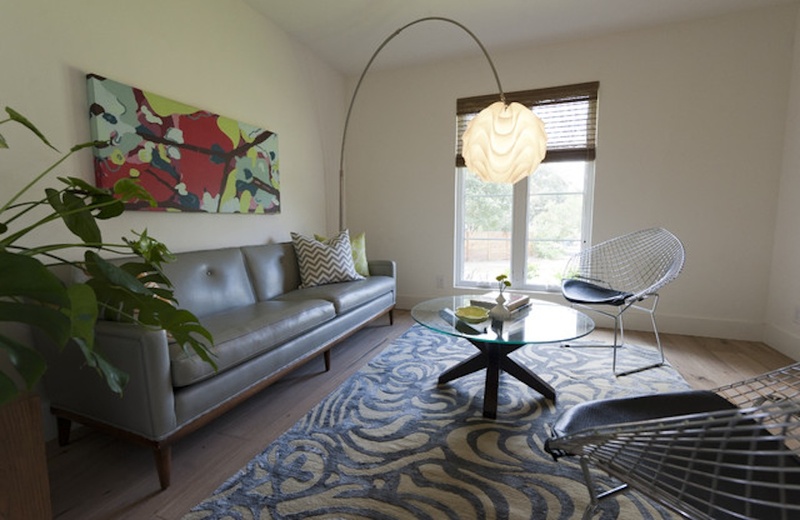 Baum and Trig Modern’s owner, Bob Drake, frequently work with local and regional furniture and casework designers for their interior design projects. They also carry local designers’ work in their showroom. For more information on this and other events associated with the exhibition “20 Years of Horse & Buggy Press,” go to camraleigh.org/exhibitions/. Even though the event is free, anyone interested in attending should RSVP to Melissa Roth at melissa.roth@camraleigh.org. For more information on Ann Marie Baum and Trig Modern, visit www.trigmodern.com. Founded in December 2012, Trig Modern is owned and operated by furniture and lighting designer Bob Drake. Through its combination of modern and mid-century-inspired furniture, lighting, wall and floor coverings, and accessories, as well as Modern kitchen and bath remodeling services, Trig Modern’s mission is to present a realistic portrait of sensible living and offer an antidote to excess, formality, and convention. For more information visit www.trigmodern.com, call 919.516.8744, and find Trig Modern on Facebook. The showroom is located at 1053 East Whitaker Mil Road, Suite 109, Raleigh, NC 27604. Trig Modern, the only showroom and design service in downtown Raleigh that specializes in modern decor, has been hired to upgrade the lobby and the eight residential corridors in The Residents at Quorum Center, a luxury condominium building also in downtown Raleigh. Baum proposed three different color palettes – teal, orange, and gray — that will ensure the modern elements she introduces are warm and inviting. The Quorum’s board will select one of them. Each color “story,” as Baum calls them, involves replacing the wood-framed, Regency-style arm chairs in the lobby with either a pair of armless slipper chairs or a sleek, modern sofa in jewel-toned, patterned upholstery. She’ll complete the vignette with modern accent tables. Each scheme also will replace the current console tables, lamps, and mirrors at the elevators – “which aren’t necessary,” Baum noted — with upholstered benches. She’ll upgrade the wall-to-wall carpet in the corridors with new striated carpet tiles that can be replaced easily if one of them is damaged or stained. “And on every floor, above each bench, as well as in the lobby, I’ve recommended installing original works of art,” Baum said. “These pieces can be rotated among the floors and eventually rotated out of the Quorum so that new pieces can be brought in.” She will work with Kelly McChessney of Flanders Gallery in downtown Raleigh for the art rotation. Baum also intends to remove all the artificial plants in the building and upgrade the lighting in the residents’ mail room. 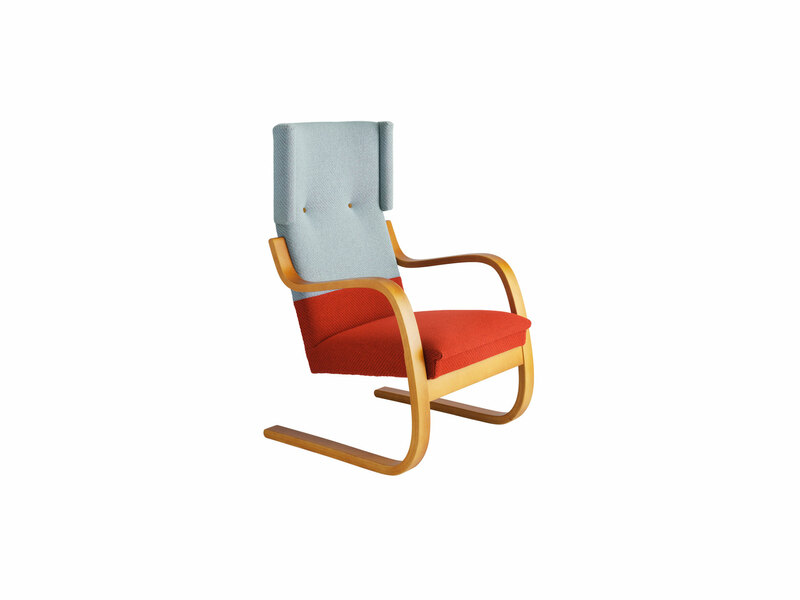 Dutch designer Hella Jongerius’ reinterpretation of Alvar Aalto’s 400 and 401 Armchair for Artek. TRIG Modern, Raleigh’s premiere Modern furniture showroom at 328 West Jones Street, will present “An Evening with Alvar, Adrian, Milo and Vladimir” when the store hosts North Carolina Modernist Houses’ (NCMH’s) “Thirst4Architecture” networking happy hour on Thursday, April 16, from 6-8 p.m. A celebration of mid-century designers, the event is free and open to the public. Emilie Huin of Coldwell Banker, a specialist in Modernist real estate throughout the Triangle, is the series sponsor for all 2014-2015 T4A happy hours, which provide opportunities for modern design enthusiasts to mix, mingle, and make strategic connections. The host business provides refreshments and other entertainment while attendees build relationships, create strategic alliances, and make new contacts. For the April T4A, TRIG Modern’s owner, Bob Drake, will spotlight iconic mid-20th-century modern chairs designed by Finnish architect, sculptor and painter Alvar Aalto; American architect and furniture designer Adrian Pearsall; American furniture designer and 2009 Interior Design Hall of Fame inductee Vladimir Kagan; and North Carolina-based Thayer Coggins’ premiere designer Milo Baughman. Examples of each designer’s chairs will be on display in the showroom. In keeping with the evening’s Mid-Century theme, Drake’s sister will cater the event, serving up classic 1950s and ‘60s dishes. Opened in 2012, TRIG Modern is the only showroom and design service in downtown Raleigh that specializes in modern furniture and lighting in tandem with an eclectic blend of compatible furnishings and accessories, including Mid-20th Century items and a throw pillow collection that Drake designed himself. Drake noted that the store’s new line of modern kitchen systems will also be on display that night. For more information on TRIG Modern, visit http://trigmodern.com. NCMH is an award-winning non-profit organization dedicated to documenting, preserving, and promoting Modernist residential design across the state. For the dates and locations of future T4A events, go to www.ncmodernist.org/t4a.